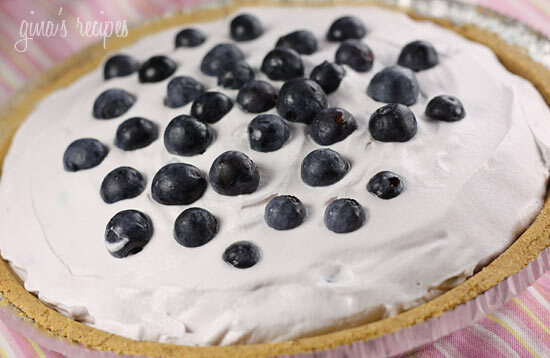 This cream pie is so light and tasty and it only takes 5 minutes to make. You can also make this with raspberries, blackberries, or strawberries. 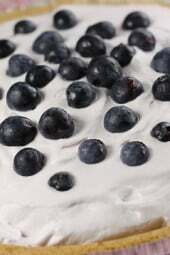 Simply substitute the blueberry yogurt for another flavor to match your fresh fruit. I brought this cream pie to a dinner and it completely disappeared! Combine Cool Whip, berries and yogurt in a bowl. Pour into pie crust and chill in the refrigerator at least one hour. Does anyone know the calorie count? Can you tell me what the calories are? I made this tonight. It turned out great, thick and creamy. I used two Greek blueberry yogurts, 2 cups chopped up blackberries in the filling, and sliced strawberries on top. It wasn’t very sweet as far as desserts go, but my 5 year old ate every bite and loved it. Where is the calorie count?!?! This was delicious! Could it be prepared and stored in freezer to have on hand for unexpected company? Thank you! this was so good!!! Going to make it with strawberries tomorrow!! Love love!! My family has been making this for years!! It was always my grandmothers request!!! Made this tonight for Pi Day 🙂 I cut the filling recipe in half and stretched that to fill 6 of the individual graham crusts. Loved it, and that was a great way for me to keep portions in check. I've made the blueberry version before and it's awesome. Tonight I tried it with Key Lime Pie Yoplait and while it was good, the lime flavor wasn't really that strong. Just an FYI if anyone ever wondered about it. Is this gluten free?? I'm making it for someone who has to eat gluten free and I have no idea about what is and what isn't. I used Greek Blueberry yogurt…turned out delicious. Tonight I am making it and adding 8oz of cream cheese…thinking this will firm it up and bit. I'm thinking it's going to be GREAT! I'm not sure if someone else asked already, but do you use regular yogurt or greek yogurt for this recipe? I love this site! Thank you Gina for the incrediable dishes, desserts, and drinks! On this dish, how many calories is it for 1 serving? I made this tonight with lemon yogurt and blueberries (what we had on hand), and it was wonderful. Thanks for another winner! @Amy, thanks for the laugh! I would probably let it thaw a little before eating, that's just my opinion.I haven't tried it frozen. Great taste. I chose to freeze it instead of refrigerate and my only recommendation if you do that is to mash the blueberries before mixing them into the cool whip/yogurt mixutre. The frozen blueberries were cold and hard on the teeth. Still delicious though. You could put a packet of unflavored gelatin mixed in. That wouldn't change the nutrition info, but would help it be a little less soupy. Ok Gina, I have made this a few times and LOVE it…but here is my question. I went to 3 stores and none had ff cool whip, only lite. Is that going to change the points in the big way? I can't seem to figure it out. Thanks, I love so many of your recipes! Glad you had success with it! Freezing it before serving is probably a good solution for those of you who had trouble making it. I have made it a couple times now, and I leave it in the freezer– it seems to not get too solid thanks to the cool whip. I also use greek yogurt which adds to the creamy texture! Thanks for giving those of us on weight watchers fun things to cook! Your recipes are fantastic (and the pictures make me hungry!). Thanks! @Tracie, yes, if the fruit is wet, I could see having a problem with it being runny. Thanks for pointing that out. I've never had a problem with it but I keep it chilled right after I make it and before I serve it. Freezing it is a great idea. Do you think this would work with Greek yogurt? Gina, I stumbled onto to your site last night and boy was I happy. Today I made your Macaroni Salad with Tomatoes and it was super super good, I also made your Blueberry cream pie, but I used 1- 8 oz bar of Philly cream cheese light, one of the fat free blueberry yogurts and half of the 8 oz Cool Whip Free, 1/4 cup of Splenda and 2 tsp. of vanilla. It was pure heaven. I did the pina colada and coconut and also added sme very well drained crushed pineapple—-it turned out waonderful!! Wow!! I love the pina colada yogurt with coconut combination!! I just may have to post that!! made again, this time used pina colda yogurt and coconut flakes, added banana's (just on top)instead of blueberries. Best combo yet! I made this, we loved it. It is not very firm. I used strawberries because blueberries were so exspensive. So nice and light. I found I could get away with half the filling and lower the points. I will experiment to see if I can get to firm up. Freeze it for 4 hours- then let thaw for 15 before serving. Tastes much better! Thanks for sharing! Never made it with jello but it seems like a great solution for those who want a firmer texture! I made something very similar to this once, but it also called for 1 pkg. of sugar free jello (I matched it to the flavor of the pie) You dissolve the jello in 1/4 cup boiling water (yes, that is all) and add to the pie. The pie firmed up nicely! Very yummy! wow! this was absolutely wonderful! I made my own graham cracker crust base using 8 reduced fat graham crackers, made into crumbs, 1 tsp of sugar and 3 tbs melted butter. I plugged it into the WW recipe builder and it came out to 3 pts for 1/8 of the pie. It sets up quite loose at first, but if you leave it in the fridge ( if you have a frost free model) overnight, uncovered, it gets firmer. Just wondering, what kind of fruit did you use? Maybe if it's a watery fruit, that could be the problem. If you use strawberries for example, I would put them on top of the pie. mine came out soupy too..might put it in the freezer for a while and take out and put into fridge for a little bit before serving…also might add a few tablespoons of splenda to sweeten it up a bit! I love it with peaches and peach yogurt! I don't know why some of you are having problems with it being runny. Are you keeping it chilled? It should stay chilled the whole time until you eat it. I use various brands of yogurt and never have issues. I have made it many times using different variations (peaches and peach yogurt, strawberries and strawberry yogurt) and have never had a problem with it turning out. My family loves it! I made this for the second time tonight and it was very soupy too. What brand of yogurt do you use? Maybe the different thickness of the yogurt matters? Sure! I would chop them in small pieces if you put them inside the pie. could you use peaches and peach yogurt? I think using strawberries, it's best to put them on top since they are watery but leaving out the yogurt im sure changed the texture as well. I'm new to the site and made this pie but used strawberries in place of the blueberries, and omitted the yogurt all together. Chilled it for over an hour and unfortunately my pie remained runny. Not sure if it's because strawberries have more juice to them or because I didn't add the yogurt. Maybe use less strawberries? This was DELICIOUS! Everyone loved on 4th of July. Can't wait to try some other variations. Lee – Did you over mix the cool whip? I did this once when trying to make a frosting with cool whip. It turned into pudding texture. I just fold the cool whip with the yogurt until they are mixed. @Lee, maybe you were just expecting something different? It's basically a cream pie. Whipped cream and yogurt with fruit. Not supposed to be firm if that is what you thought. Yes, the pie went right into the fridge and stayed there for hours. @ Lee, not sure, it's really hard to mess this up! Did you keep it cool? It needs to stay refrigerated until you eat it. I gave this a try. Tasted great but was disappointed with the soupy, gloupy texture. I wonder what I did wrong? Ooo this looks great! It's so light I bet it wouldn't hurt to add a little glaze of SF blueberry preserves melted and poured over! Perfect for the 4th of July Celebrations!! This looks super-light and airy! Any idea how long this would keep in the fridge? Can't wait to try it. i make this all the time. i could sit and eat the whole pie in one sitting. i always get compliments on it. easy and good and cool for summer. sounds great! can't get much easier than that! Is that 2-5.3oz containers of yogurt? Or 25.3oz? Can't wait to try this for our 4th celebration.